Las Vegas is known as the ultimate adult playground, so the current construction of the nation’s largest Ferris wheel right on the strip should come as no surprise. Developer Howard Bulloch has been busy building Skyvue, a 500-foot carnival contraption that will be located directly across from the famed Mandalay Bay. 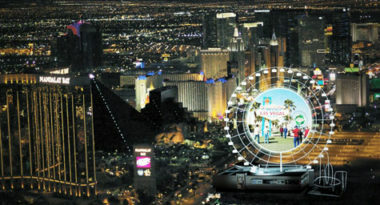 While the towering structure should be enough to catch everyone’s attention since it will be visible from any point in the Las Vegas valley, the issue capturing the ad industry’s attention is the 50,000-square-foot LED sign on either side of the wheel which will make it the biggest branding vehicle in the United States. Adweek.com reported on the wheel’s worthwhile branding potential. Mr. Bulloch’s plans for turning Skyvue into a branding goldmine include offering category exclusives, with one brand each for the automotive, electronics, and beverage segments. The three brands will split time on the LED signs, as well as on other marketing elements throughout the actual wheel. These include retail and convention space, along with 32 passenger gondolas which can be outfitted as airborne brand showcases. Considering that Skyvue is expected to host 4 million riders per year, it can provide unparalleled exposure for participating brands. “This is really experiential marketing on steroids,” Mr. Bulloch said. Branding experts agree that Skyvue can be a major marketing boon for the brands that can afford it. On top of the immediate exposure benefits comes the secondary advantage of visitors sharing photos and videos on social platforms, the Web and throughout the global media. To some, this is just another example of branding ego meeting Vegas excess. From a marketing perspective, there is no denying that Skyvue can literally launch a brand’s image sky-high. To learn how innovative branding can increase your company’s expossure and drive sales, contact MDG Advertising today at 561-338-7797 or visit mdgadvertising.com.